Many modern artists find themselves returning to familiar themes for continued exploration. Catalan artist Jaume Plensa has created a catalog of large curved metal sculptures shaped into contemplative figures. I find something other-worldly about these figures, especially those made of letters, as if this were some futuristic totem waiting for us to decode them. 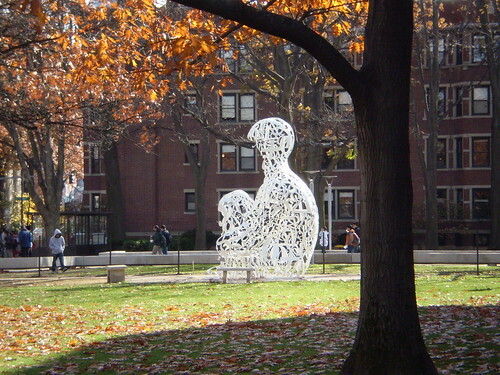 Jaume Plensa was commissioned by an MIT alumnus to create The Alchemist in honor or the University’s 150th anniversary in 2011. 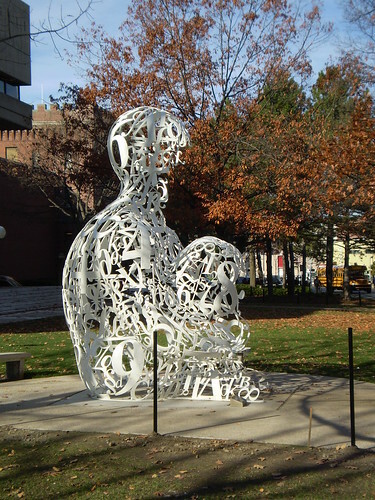 The seated figure is composed of numbers, letters and mathematical symbols. Originally planned to be exhibited for only one year, the Alchemist has been such a success on campus that the alumnus donated the piece to MIT. The selection of this piece and its placement in front of the Student Center could not be better. The Alchemist seems to be the personification of thought as an active process. The swirling equations not only create and but absorb the Alchemist figure. Pretty appropriate for one of the best universities in the US, don’t you think?